I had replaced ghee with olive oil. 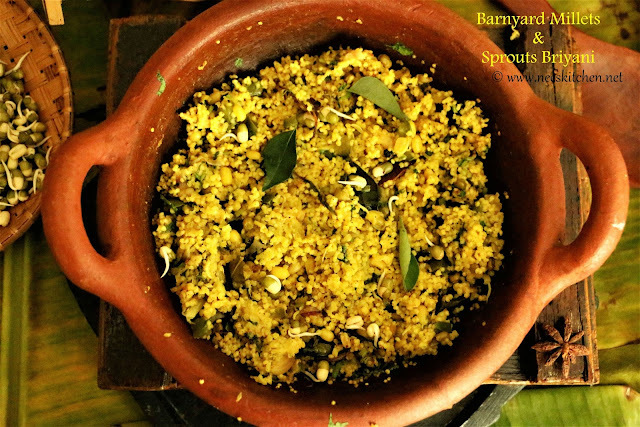 Regular vegetables used in any briyani are replaced with moong sprouts to make it more healthy. You can mix and match with vegetables of your choice. 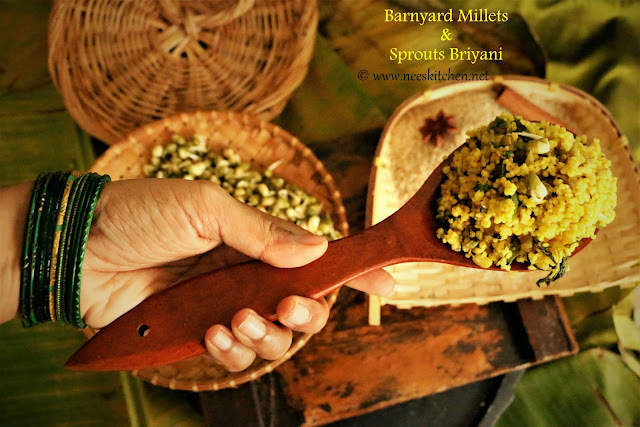 There has always been a fear for many of us to cook millets in claypot with the assumption that they would get stuck easily if over heated. That is not the case actually, it is easy to cook in claypot rather than non-stick or aluminium containers. I have taken the video using a claypot kadai. Follow my millets collection in googleplus for future references. 1. Take a claypot and add oil. 2. Add the masala spices one by one starting with bay leaves and followed by cinnamon, ani seed, Marathi moggu, cloves and kalpasi. Let it cook. 3. Add green chili and garlic and fry them. 4. Add onion and capsicum and fry them well. 5. 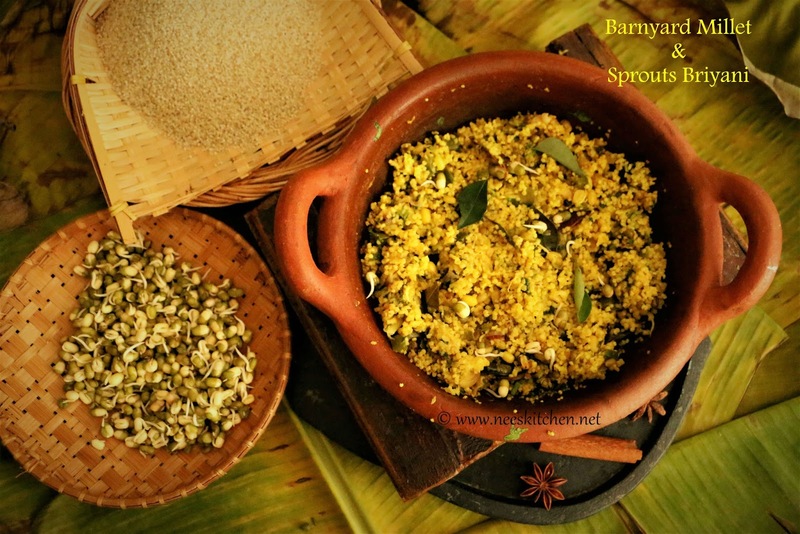 Add curry leaves and sprouts and mix them well. 6. Add mint leaves,salt and turmeric .Fry them well. 7. Add 1 cup of water and allow it to boil. 8. Sprinkle barnyward millet and keep mixing them. 9. Close with a lid and keep mixing them at regular intervals. 10. Once cooked, switch off the gas. 11. 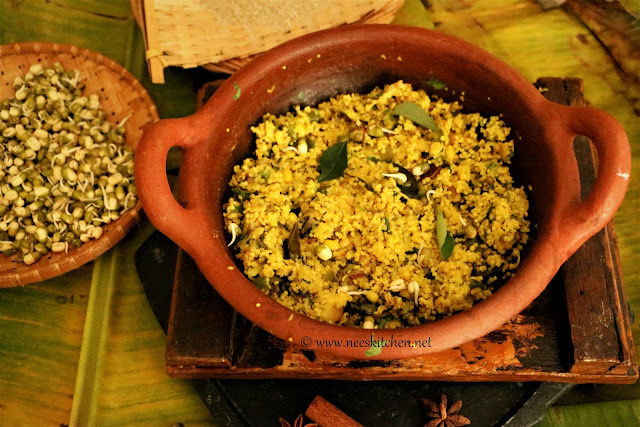 Add briyani masala and coriander leaves and mix them well. The heat in the claypot is sufficient for the flavors to infuse. 1. Olive oil can be replaced with ghee if needed. 2. Since claypot is used, heat is retained for a long time. No need to transfer to a hot pack.